Today's collection is sheds! It is so cool how the boring old storage shed can transform into such a lovely picture perfect spot. I'd love to have a cute storage shed like any one of these in my backyard. I think I'll take one of each: one office. one kids playhouse. and one cool hangout/lounge. Does anyone have a cool shed setup like this? 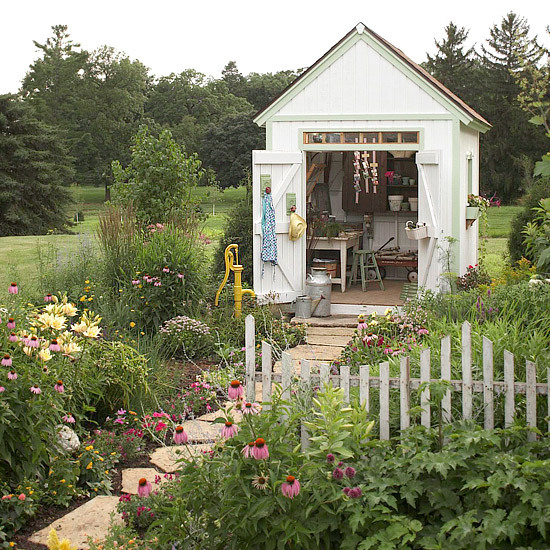 love this shed + the landscaping / the cutest little storage shed I've ever seen! the most awesome kid playhouse ever! 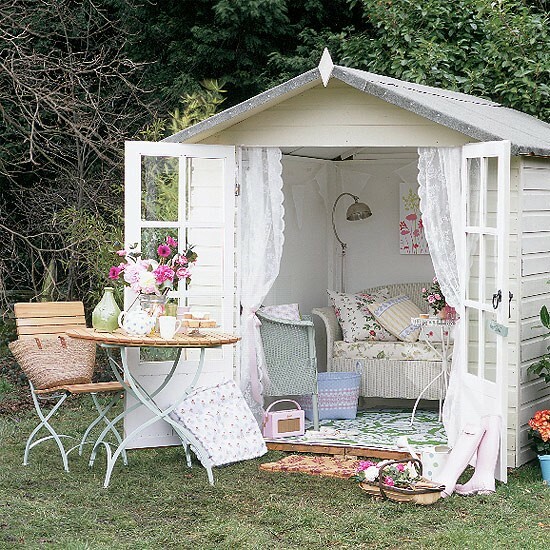 / the prettiest backyard shed. we have a toolshed at our old house (that we are renting out now)! now i wish that i made it all cute when we owned it! You thought you could get away with it by not mentioning it on the blog, huh? Hee hee. I LOVE these collections posts! Great inspiration! ahh, love them all. wish i had one made mostly of windows for natural light and an AC wall unit :-P I'd use it as a photo & painting studio/craft space. xo! I just at an open house this weekend by the lake that had this awesome shed! The lady, I think, ran her own vintage business & her shed was filled with vintage furniture projects & all these bits and bobbles. It was so pretty! After looking at all these pictures, now I want a little shed more than ever! I love this collection! I've always wanted a little backyard shed all my own and now you've scratched my itch at least for the day. Thank you! I especially love the 7th one, so colorful ! now i need a shed. My hubby recently got a shed but it's NOTHING like these! Oh, what a great way to have a private oasis all to yourself =) I may have to tell my hubby to give our shed a makeover! These are all so dreamy! What a great collection post! Ok, I'm off to buy a shed! Fabulous post. Love the shed next to the lake - I think I really need one of those...! these are amazing! i'd love my own little shed hideaway. I don't know which is my favorite, I'm obsessed with them ALL! Those are really lovely and brilliant ideas. I have some sheds in my garden of which I make into personal sanctuary. I plan to put some comfortable chair for me to rest after working in my garden. Thanks a lot for this.